1. 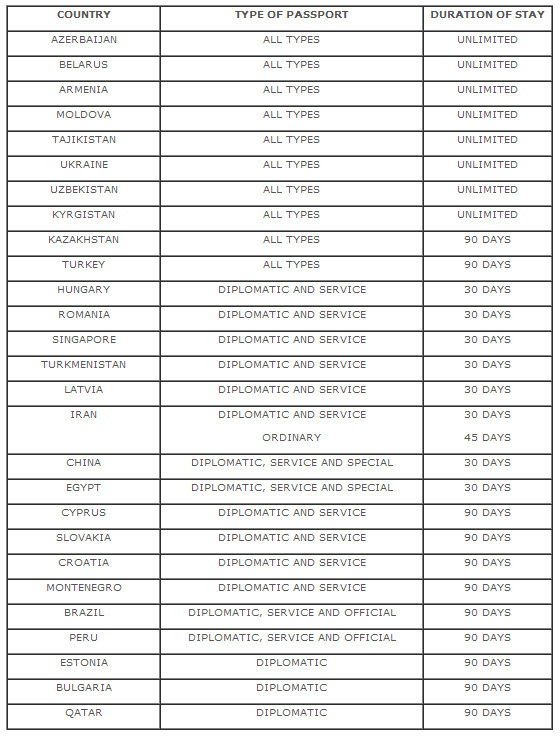 Foreign staff of diplomatic missions and consular posts, as well as similar representations accredited to Georgia need visas for their first entry to the territory of Georgia. During their accreditation period they stay in the country and cross the border on the basis of accreditation card issued according to the determined rule of the Ministry of Foreign Affairs of Georgia, if other is not provided by international obligation. 2. In cases determined by the Georgian legislation visa/entry permit for up 90 days (visa fee 50 GEL) or for 360 days (visa fee 100 GEL) can be issued by the Patrol Police of Georgia (sub-divisional institution of the Ministry of Internal Affairs) at border crossing points situated at the Georgian State Border. 3. The basis for the stay of an alien in Georgia is a visa or residence permit (permanent or temporary) if other is not provided by this law and international treaties of Georgia. 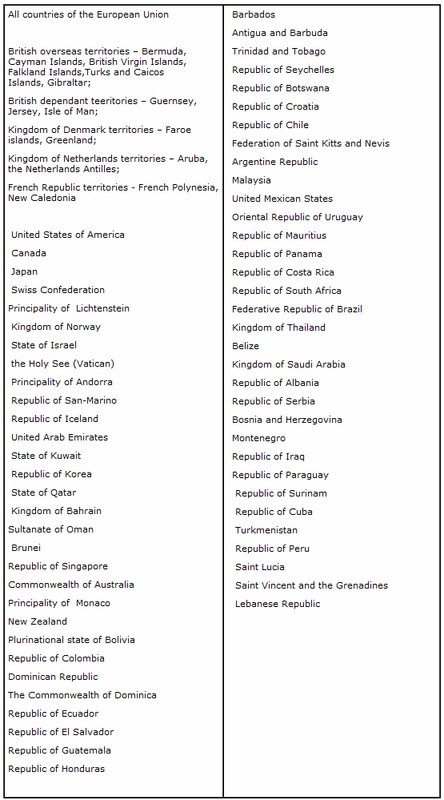 Foreign nationals, who permanently reside in the USA, the Republic of Lithuania, Swiss Confederation, Federative Republic of Germany, Republic of Korea, Czech Republic, Republic of Hungary, Republic of Poland, Republic of Slovenia, Kingdom of Denmark, Island, Kingdom of Norway, Kingdom of Sweden, Kingdom of Spain, Republic of Bulgaria, Slovak Republic, Republic of Romania, Republic of Estonia, Republic of Latvia and possess a document certifying permanent residence in one of these countries, do not need visa to enter and stay on the territory of Georgia up to 360 days. Foreign Nationals, who have temporary residence document and reside on the territory of the State of Qatar, Sultanate of Oman, Kingdom of Bahrain and State of Kuwait do not need visa to enter and stay on the territory of Georgia up to 360 days. The citizens of Russian Federation do not need visa to enter and stay on the territory of Georgia up to 90 days. The citizens of the member states of European Union can enter Georgia on the basis of the Identity Card. Foreign nationals who have a multiple entry US, EU or Schengen member states visas, which have validity for one year or more and had been used once at least, can enter or stay on the territory of Georgia without visa up to 90 days, within the validity term of the visa. 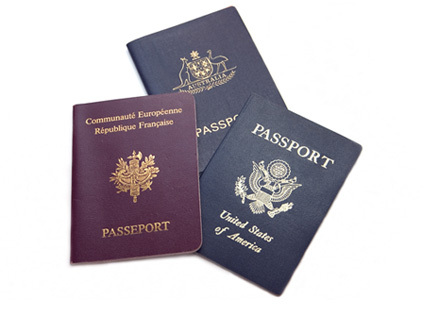 Also it should be taken into account that persons who possess ordinary visas, in case of staying on the territory of Georgia longer than the period determined by the visa, should apply to the Ministry of Justice - Civil Registry Agency (www.cra.gov.ge) to receive temporary or permanent residence before the expiration of their visas. Foreign citizens legally being in Georgia, in case of their willingness to stay in the country may apply to any territorial office of the Civil Registry Agency and in case of producing all necessary documents receive Ordinary Visa of Georgia. Two types of ordinary VISA are issued by the territorial offices of the Agency: 1. multiple ordinary VISA valid for 360 days; 2. Single ordinary VISA valid trough 90 days. Documents that must be attached to the application for receiving VISA in territorial office of the Agency are: foreigner’s passport, 1 colored picture (size 3X4) and fee payment receipt. Fees for issuance of Georgian Ordinary Visa are following: Multiple ordinary VISAs for 360 days – 100 Georgian Lari, Single Ordinary VISAs for 90 days – 50 Georgian Lari. Territorial office is making decision on issuance of VISA during 7 days after receiving the application from foreigner. - If an alien leaves the territory of Georgia during ten days after expiration of the term of his/her legal stay he/she would not bear administrative responsibility in the form of penalty. - An alien staying in Georgia during the period up to three months after expiration of the term of his/her legal stay and willing to leave the territory of Georgia voluntarily has the right to exit from the territory of Georgia without impediment. Also, an alien is obliged to pay the certain amount of penalty before or after leaving the country. In case the amount is not paid he/she will not be given a Georgian visa until he covers the abovementioned debt. - An alien staying in Georgia illegally more than three months after expiration of the term of his/her legal stay and willing to exit from the country voluntarily has the right to leave the territory of Georgia without impediment. Also, he/she is obliged to pay the certain amount of penalty before or after leaving the country. Georgian visa and the permit to enter Georgia will not be issued to him/her for one year.